Last week I posted about some ink printing I had done. 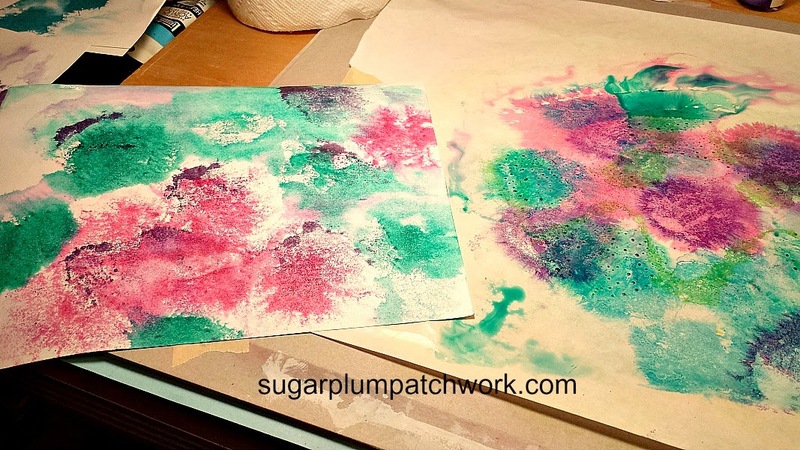 It's really fun and easy so today I thought I would post a tutorial of the process I used. 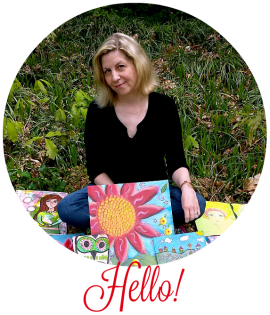 It's really a fun and easy process and a great way to make pages for journals, collage, cards, etc., etc. Paper to print on - I used card stock from the office supply store. 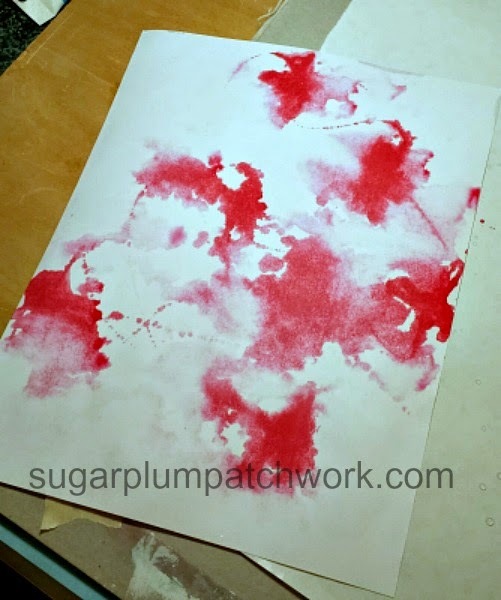 Tear a piece of freezer paper larger than the paper you are printing on, and tape it to your work surface. Next, use your fingers to sprinkle some water drops on the freezer paper. 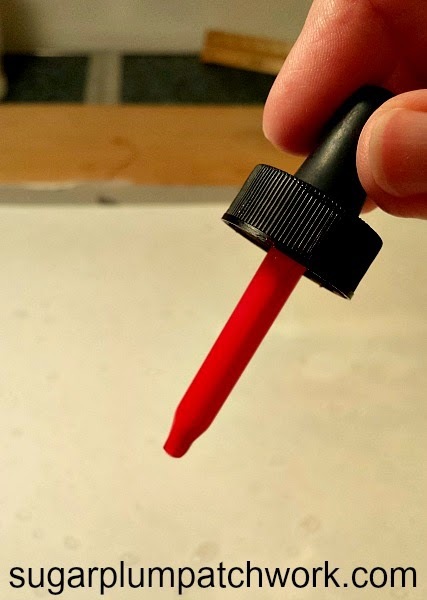 Then use the dropper in the ink to drop some ink on the page. 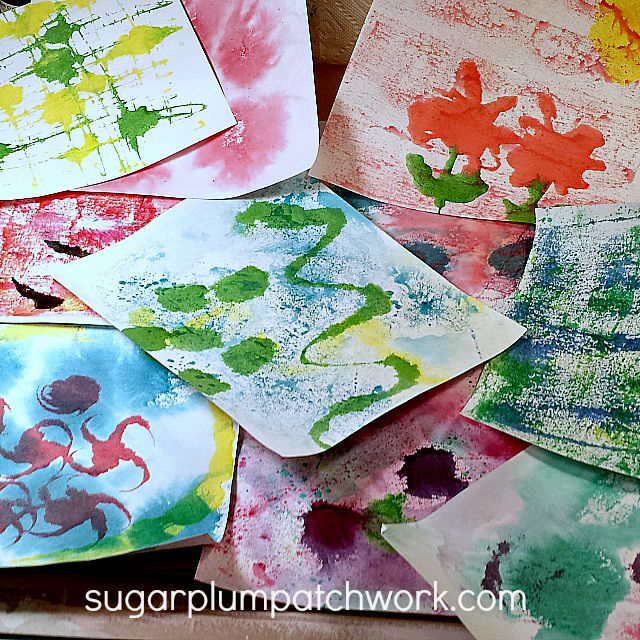 Using the handle end of the paint brush drag the ink around on the freezer paper. 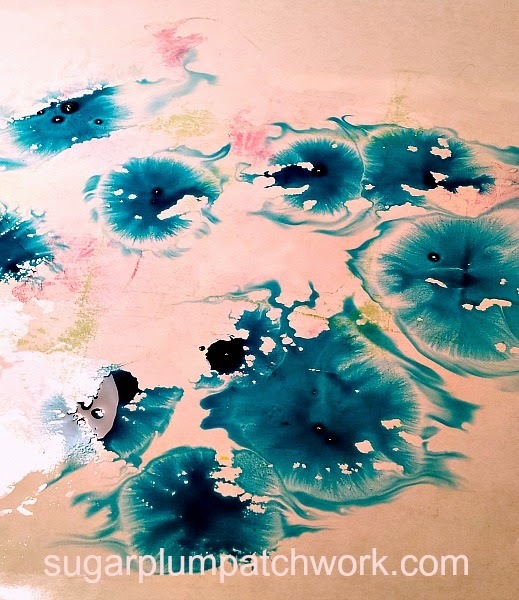 The ink will blend with the water droplets in places. 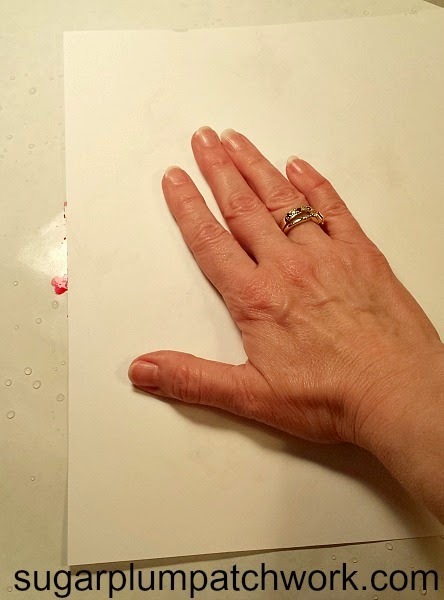 Place a piece of your paper down onto the freezer paper and rub the back of the paper with your hand. 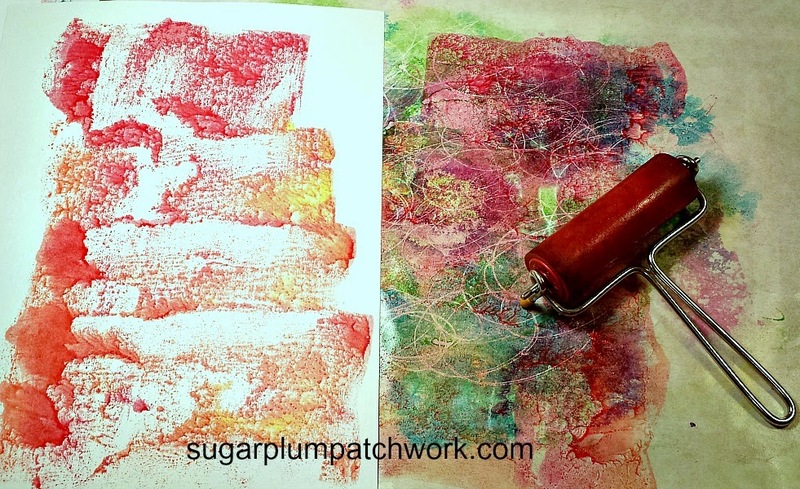 or you could use a brayer. Then carefully peel the paper up off the freezer paper. Below is what my first print looked like. 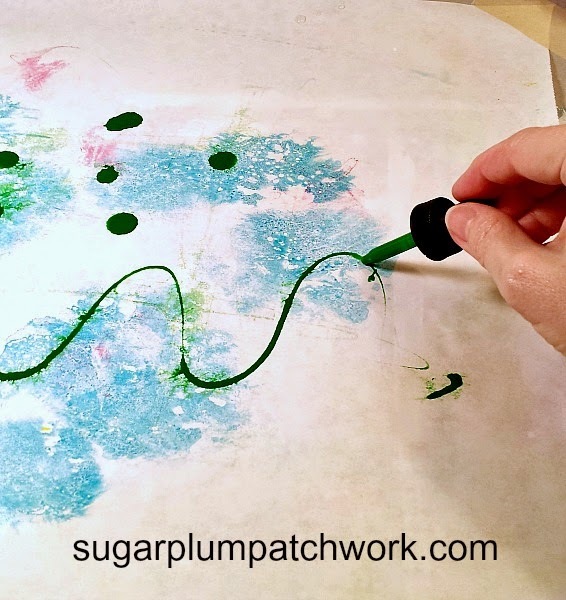 You can see how the ink blended with the water in places to make a pastel color, and you can see the lines from dragging the tip of the paintbrush handle through the ink. 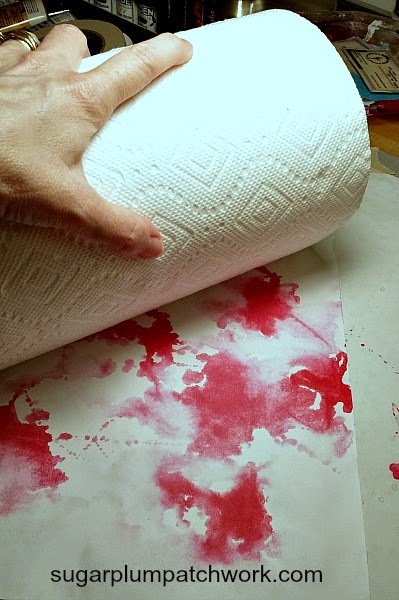 If there is lots of wet ink left on your page you can just roll the paper towel roll across the paper to blot it. 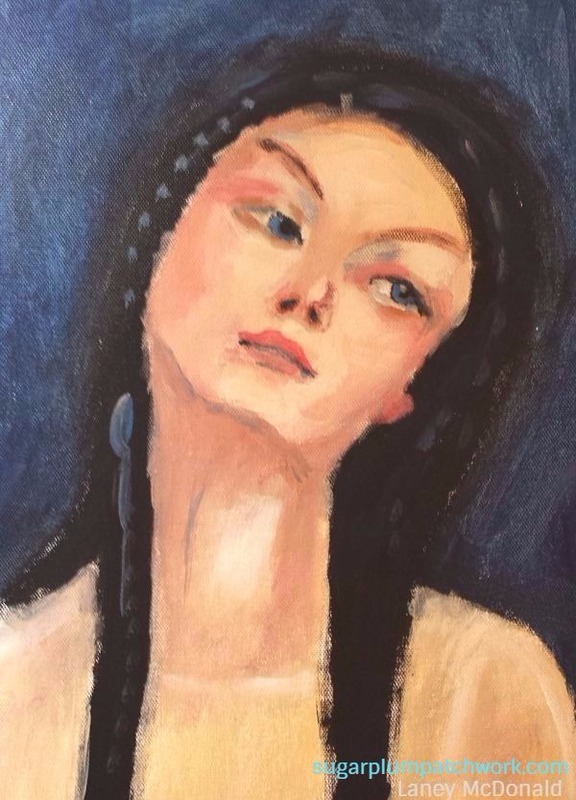 This next one is done in the same manner but with two colors of ink dripped onto the freezer paper and I dragged the paintbrush in vertical and horizontal lines. 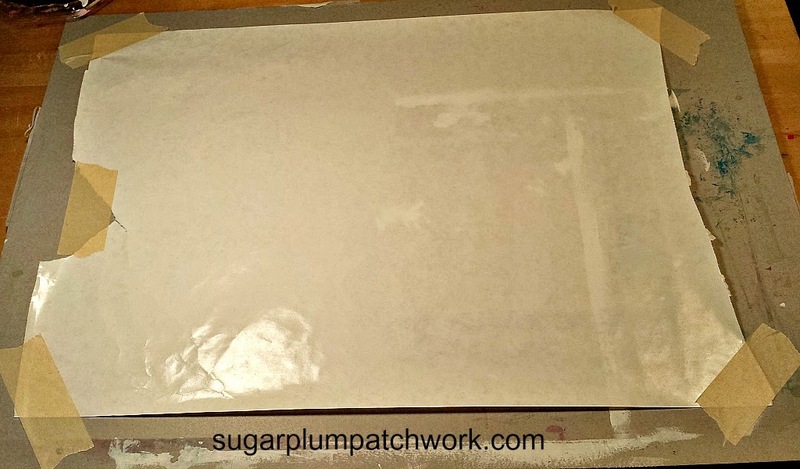 Be sure to wipe the freezer paper off between prints if you don't want the lingering ink to color your next print. But that may give a nice effect depending on what you are trying to achieve. Now let's try a different technique. This time put a good amount of water on the freezer paper and rub it all over the surface. Kind of like when you finger painted as a kid. 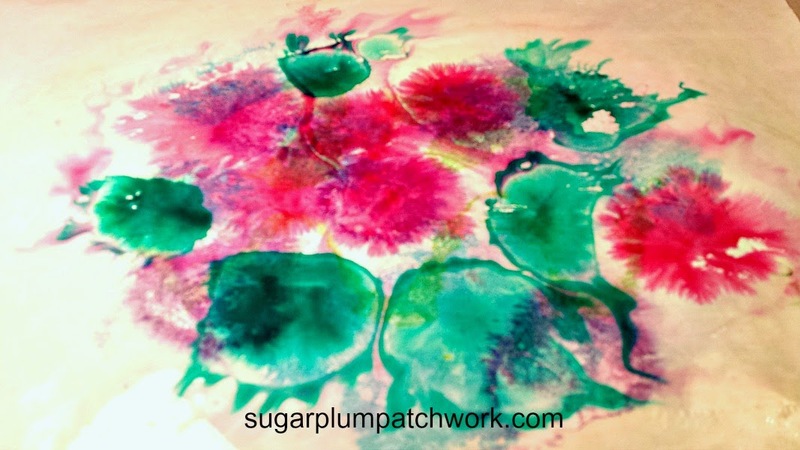 Then, drip drops of ink onto the wet surface. The ink will spread and "bloom." You can do two (or more) colors of ink at once. Here's the print I got from the above ink. 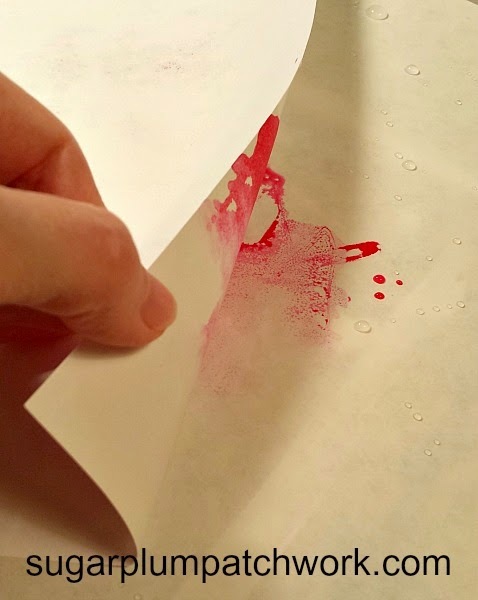 You may notice that your freezer paper is becoming stained by the ink. 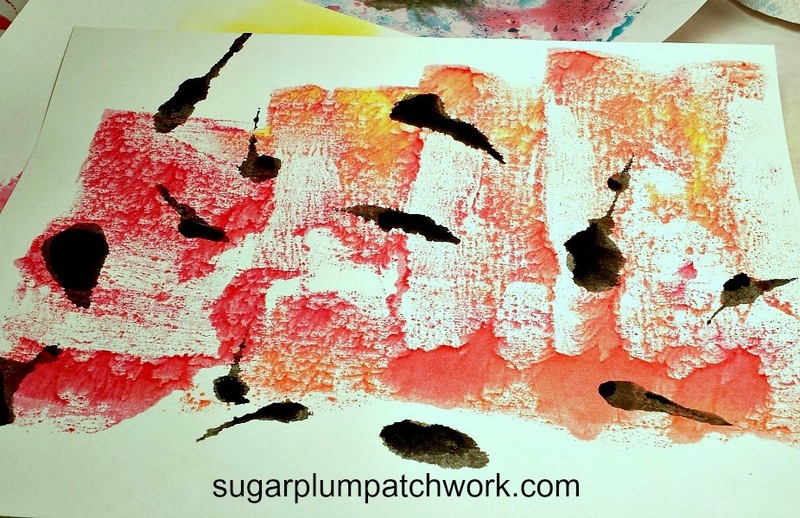 That's a bonus - another texture of paper for you to use in your mixed media art! Now it's time for another technique. 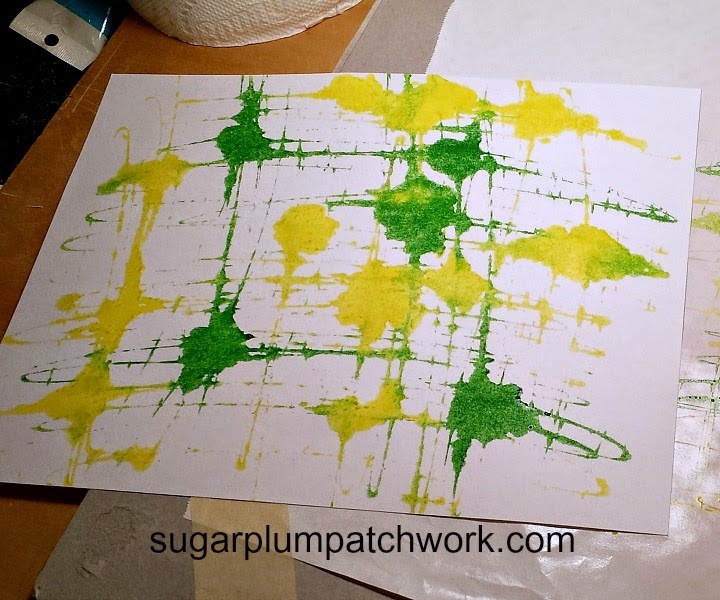 Lets drip paint onto the dry freezer paper and use a brayer to roll it around over the freezer paper. Below: Left - the print I got; Right - the plate before printing. Next, some of the first papers you printed are probably getting dry now. So keep going and start printing another layer on them. 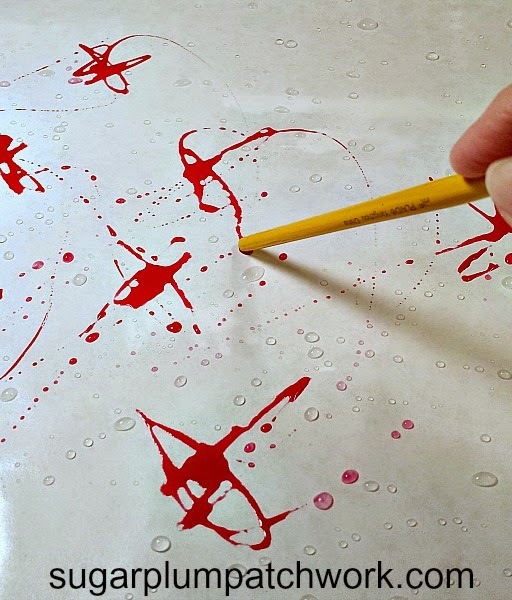 Get creative and try some new techniques - like drawing with the dropper. 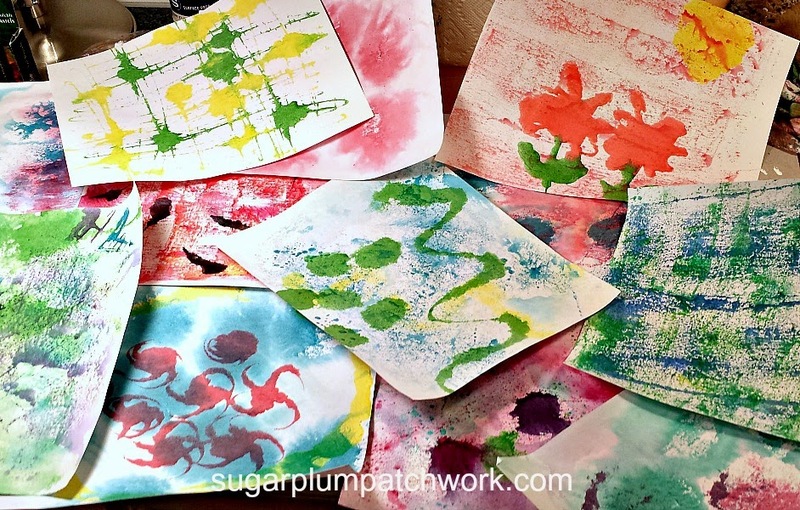 Or put some diluted ink in a spray bottle and spray onto the paper. Soon you'll have your own stack of papers to use however you like. I hope you enjoyed this tutorial and will give it a try! Let me know if you do. I'd love to see what you create. Beautiful pages Laney!! Thanks for sharing your process! This looks like fun! Thanks for the informative post. It is always fun to have new ideas to try. Thanks! oohhh these are amazing. Thank you for showing this technique. You created some beautiful papers! I love playing with colours like you do in your presentation! I think I need a brayer! This is such an unique technique with beautiful results. I can think of so many uses for the papers you created. Thank you so much for sharing your tutorial. I'd love to try this one day with my kids.